The Pinal County Board of Supervisors played host to the unveiling and ribbon cutting ceremony of a Mobile Veteran Outreach Center at the Historical Courthouse on Saturday, September 19. The non-profit organization, Honoring/Hiring/Helping Our Heroes of Pinal County (HOHP), acquired an RV (“Eagle One”) from Pinal County for $1.00. 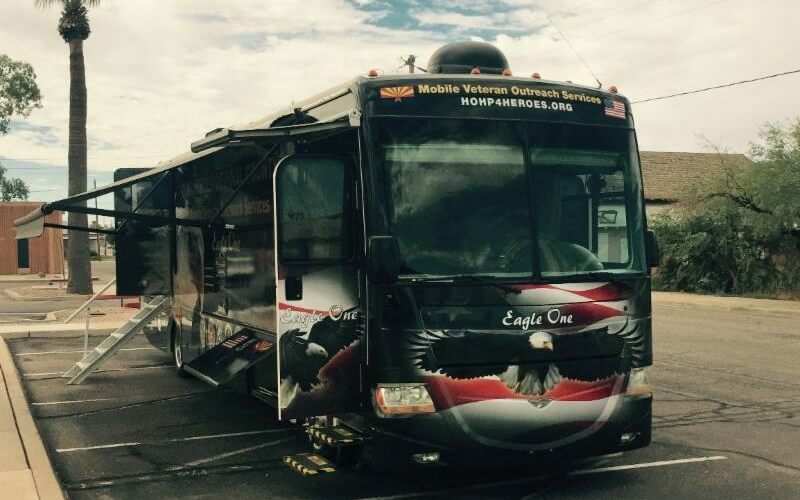 Veterans, volunteers, elected officials and members of the pubic gathered to hear the story of how Eagle One, one of two mobile units for veterans in our State, became reality for veterans in Pinal County. Rodriguez also thanked the many groups and individuals that contributed to raise the $7,500 needed to wrap the RV. Schryer shared how the need was explained to County Manager Greg Stanley, Assistant Manager Leo Lew, and the Board of Supervisors, where it was clear to project had their support. After working with Kevin Costello from the County Attorney’s Office, the proper legal process was determined to sell the county RV for $1.00, since HOHP is a non-profit organization.